Definition: Metabolic syndrome, sometimes known by other names, is a collection of risk factors that increase the chance of developing heart disease, stroke, and diabetes. “Insulin resistance syndrome”, “American syndrome”, and “syndrome X” are synonyms for the term metabolic syndrome. The name “syndrome X” also has other meanings. Lifestyle changes like losing weight, exercise, and dietary changes can help prevent or reverse metabolic syndrome. The syndrome is thought to be caused by an underlying disorder of energy utilization and storage. The cause of the syndrome is an area of ongoing medical research. Approximately 20–25 percent of the world’s adult population has the cluster of risk factors that is metabolic syndrome. In 2000, approximately 32% of U.S. adults had metabolic syndrome. In more recent years that figure has climbed to 34%. Metabolic syndrome is closely linked to overweight or obesity and inactivity. It’s also linked to a condition called insulin resistance. Normally, people’s digestive system breaks down the foods they eat into sugar (glucose). Insulin is a hormone made by their pancreas that helps sugar enter their cells to be used as fuel. Obviously, having any one of these risk factors isn’t good. But when they’re combined, they set the stage for serious problems. These risk factors double people’s risk of blood vessel and heart disease, which can lead to heart attacks and strokes. They increase their risk of diabetes by five times. 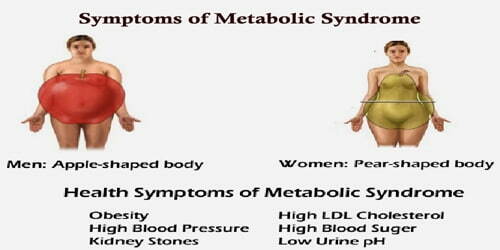 Signs and Symptoms of the Metabolic syndrome: Usually, there are no immediate physical symptoms. 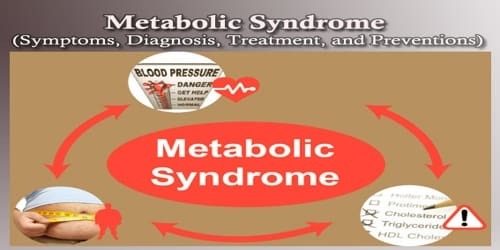 Medical problems associated with the metabolic syndrome develop over time. The key sign of metabolic syndrome is central obesity, also known as visceral, male-pattern or apple-shaped adiposity. It is characterized by adipose tissue accumulation predominantly around the waist and trunk. 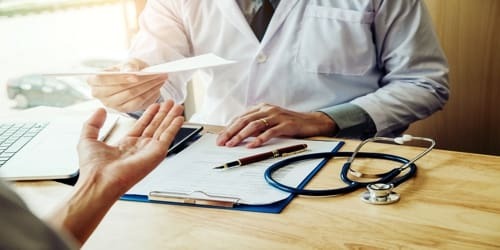 Other signs of metabolic syndrome include high blood pressure, decreased fasting serum HDL cholesterol, elevated fasting serum triglyceride level, and impaired fasting glucose, insulin resistance, or prediabetes. Associated conditions include hyperuricemia; fatty liver (especially in concurrent obesity) progressing to nonalcoholic fatty liver disease; polycystic ovarian syndrome in women and erectile dysfunction in men; and acanthosis nigricans. A waistline of 40 inches or more for men and 35 inches or more for women (measured across the belly). A triglyceride level above 150 mg/dl. A fasting blood glucose (sugar) level greater than 100 mg/dl or is taking glucose-lowering medications. A high density lipoprotein level (HDL) less than 40 mg/dl (men) or under 50 mg/dl (women). High-sensitivity C-reactive protein has been developed and used as a marker to predict coronary vascular diseases in metabolic syndrome, and it was recently used as a predictor for nonalcoholic fatty liver disease (steatohepatitis) in correlation with serum markers that indicated lipid and glucose metabolism. Metabolic syndrome is a group of risk factors that include abdominal fat, high blood pressure, high blood sugar, and unhealthy cholesterol levels. Treatment is focused on tackling each of these conditions. If aggressive lifestyle changes such as diet and exercise aren’t enough, the doctor might suggest medications to help control people’s blood pressure, cholesterol levels, and blood glucose. Medications: Generally, the individual disorders that compose the metabolic syndrome are treated separately. Diuretics and ACE inhibitors may be used to treat hypertension. Various cholesterol drugs may be used if LDL cholesterol, triglycerides, and/or HDL cholesterol is abnormal. Diet: Dietary carbohydrate restriction reduces blood glucose levels, contributes to weight loss, and reduces the use of several medications that may be prescribed for metabolic syndrome. In most cases, the best treatment for metabolic syndrome rests with people. Changes to their behavior — such as eating healthier and getting more exercise — are the first things their doctor will suggest. By adopting some healthy habits, people may be able to eliminate their risk factors completely. Preventions of the Metabolic syndrome: Various strategies have been proposed to prevent the development of metabolic syndrome. These include increased physical activity (such as walking 30 minutes every day), and a healthy, reduced calorie diet. Most healthcare providers recommend 150 minutes of aerobic exercise each week. Exercise may reduce the risk of heart disease even without accompanying weight loss. 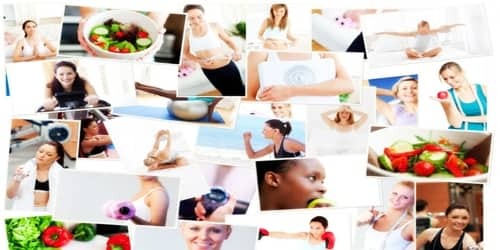 Moderate weight loss, in the range of 5% to 10% of body weight, can help restore our body’s ability to recognize insulin and greatly reduce the chance that the syndrome will evolve into a more serious illness. This can be done via diet, exercise, or even with help from certain weight-loss medications if recommended by the doctor. The Caerphilly Heart Disease Study followed 2,375 male subjects over 20 years and suggested the daily intake of a pint (~568 ml) of milk or equivalent dairy products more than halved the risk of metabolic syndrome. Some subsequent studies support the authors’ findings, while others dispute them. A systematic review of four randomized controlled trials found that a paleolithic nutritional pattern improved three of five measurable components of the metabolic syndrome in participants with at least one of the components.